LaStone Therapy is a specialty treatment that uses smooth, heated stones. 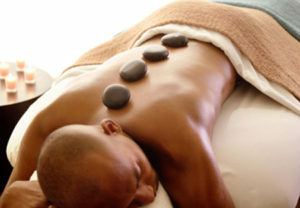 Heated and cooled stones are applied to the body to bring about balance and relaxation. The stones are soothing and the temperatures penetrate deeply into the skin. The physiological benefits of alternating hot and cold to the body have long been scientifically and medically proven. The heated stones bring oxygenated blood to the area of application, increasing lymph flow and metabolism. The cold stones push away congestion and inflammation. LaStone is also a very good detoxification program and an excellent immunity system booster. LaStone therapy is also a very good relaxant for the mind. The alternate application of hot and cold stones causes alternately sedative and energizing responses. This lulls the mind into a deep state of relaxation. A lot of clients have reported the feeling of being in a deep meditative state by the end. I have had the pleasure of experiencing the Hot Stone and Raindrop therapy with Marguerite and found both of these sessions highly therapeutic and relaxing. I highly recommend anyone needing to release the stress of your daily life to invest in either one or both of these therapies. You will not be disappointed. Absolutely the best hot stone I have ever had. You think you know what relaxation is until you experience it. Marguerite is a healer. Additionally, you must try the Raindrop technique where she incorporates essential oils. Marguerite is also very knowledgeable on skin health. She can assess what is needed and customize a facial that works perfectly for you. The facial includes a wonderful hand and foot massage. Love her!!! © 2019 Scottsdale Skin Rejuvenation. All Rights Reserved.